I awoke last weekend to the sound of sirens down on the main road and later saw helicopters hovering on the outskirts of the village. But it was not until someone phoned to check if we were OK that I realised what was wrong. Heavy rain had fallen all day on Friday and through the night. The severity of the weather was indicated by a dead house martin in the porch with no visible signs of being mauled by our cats. But still I had to switch on the television before I realised the full extent of the flooding almost on our doorstep. The river Leri (Eleri) had burst through banks and over bridges to flood two nearby villages and engulf a riverside caravan site situated just below our village. The helicopters were rescuing stranded people from the caravans. We stayed at home for the rest of the weekend. The river Rheidol had also burst its banks and flooded the retail park in Aberystwyth. Living on a hill we were unaffected as the rest of the weekend was quite dry and sunny. 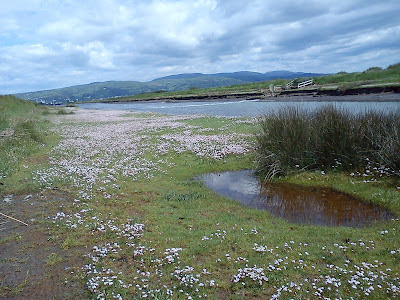 I left it a few days before taking a bus to the river estuary at Ynyslas and walking the four miles or so back along the river valley. 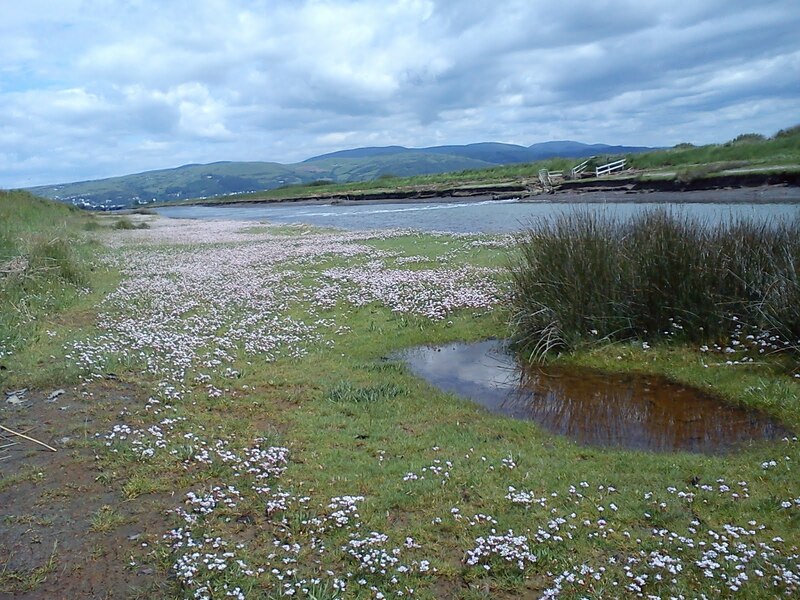 The river was diverted in the 19th century so the final mile or so to the estuary is a wide straight channel which was constructed to drain an area at the edge of Borth Bog (Cors Fochno) to create new fields. Some of these fields have since been allowed to revert to wetlands and are managed as part of the Cors Fochno nature reserve. Other fields are still farmed but one of these resembled a lake and a farmer was using his tractor engine to drive a larger pump which was transferring water from the field over the embankment into the river through a huge pipe. It looked like he would be there for some time. There was a considerable amount of debris along the silty edges of the banks, mostly tree branches and other natural objects, but also manufactured items including a large calor gas canister such as those used on caravan sites. All along one side of the bank, apparently unaffected by the flood, grew as mass of Thrift - or Sea Pink - flowers (see picture above). It was not until I reached the point where the embanked straight channel changed to the narrower curves of the natural course of the river that the real devastation of the flood became apparent. The river level was much higher than usual, the water grey with silt and running at great force. The bankside vegetation had all been flattened and a line of silty deposits indicated where the waters had risen over the banks. There is a place where I have often stood in the shade of alders watching the easy flow of the silvery waters, and where I once saw a kingfisher flash through a pool of light beneath a gap in the canopy. It was no place to stand now, but I stood there anyway. A dragonfly hovered for a moment, in the distance I heard a cuckoo calling from the willow carr; life went on. Further upstream I passed through one of the villages that had been inundated. A house right on the river had windows and doors wide open to take advantage of the sunny day and the light breeze to dry it out. Gardens were covered in silt and sodden household items were piled up against a wall. I avoided the path I usually take which follows the river past the caravan park. But looking down from a higher path I could see tarmac paths uplifted from their foundations, elsewhere items were scattered randomly or stacked neatly where the clean-up had begun. People with diggers, tractors or just shovels were busy at the task. Climbing the slope back up to my house its steepness seemed like a blessing. The blue skies were beginning to cloud over. More rain was on the way. Nest ti gwrdd a'r llyffant?! Glad you and yours are safe! Chwiliais am y Llyffant i ofyn sut i atal y glaw - ond ni welais mohono fe.